During the Safety Day in March, we introduced Wärtsilä's ten life-saving rules. 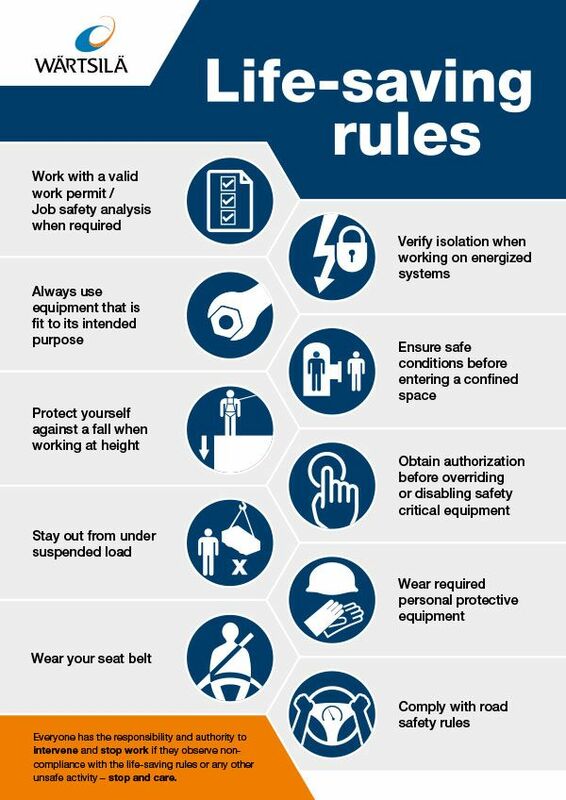 These rules have been set up in line with our zero accident objective to protect every employee, person involved and even family members from serious injury or even a fatal accident. The rules have been created on the basis of the lessons learned from fatalities and life-threatening incidents which have occurred in Wärtsilä operations in recent years. Be aware and understand that you have the responsibility and authority to intervene and stop work if you see that the life-saving rules are not being complied with, or there is any other unsafe activity taking place – stop and care. Wärtsilä has a zero tolerance regarding breaches of life-saving rules, anywhere in the world, and each Wärtsilä local company has a disciplinary procedure in place to address safety violations according to a global toolbox. The life-saving rules are intended to supplement and support existing safety management systems, programmes and policies, like the alcohol and drug policy. Engage with your supervisor if there are challenges in following these rules or if you have questions about measures that could be applied in case of non-compliance or violation of the life-saving rules. Besides your supervisor, you could also contact the QEHS department for advice: Gerrit Bargeman, Twan Takken, or one of the QEHS employees at your location.